Improvised explosive device and a vehicle-borne improvised explosive device targeted Basil street in Raqqa city. According to reports, nine civilians were killed and nine were wounded in the explosions. Unknown gunmen executed three individuals from Palmyra near the village of Al-Hawra, southwest of Raqqa city. Suicide vehicle-borne improvised explosive device targeted a CJTF-OIR‘s patrol on a road near Al-Shaddadi in southern Al-Hasakah. Reports suggest that there were no casualties in the incident besides the perpetrator. Improvised explosive device killed a son of Hayat Tahrir al-Sham’s commander, Thaer Rahal in the village of Maarat Misreen. Separately, two improvised explosive devices wounded two civilians near Maarat Misreen and Al-Ziraea roundabouts in Idlib city. Improvised explosive device wounded two civilians on the road between Binnish and Idlib city. Ansar al-Tawhid launched an inghimasi (suicide fighters) operation targeting a National Defense Forces’ camp near Tayyibat al-Imam in northern Aleppo. According to reports, between three and six elements of the National Defense Forces and three elements of Ansar al-Tawhid were killed in the encounter. Hayat Tahrir al-Sham raided Ahrar al-Sham’s headquarters, detained one of its elements and seized a mortar in the city of Qalaat al-Madiq. In response, Ahrar al-Sham took control of a Hayat Tahrir al-Sham’s checkpoint in the area, even though the latter released the detained element. Islamic State’s Amaq Agency stated that an improvised explosive device killed three elements of the Syrian Democratic Forces in the village of Al-Baqan. Improvised explosive device killed a civilian in Al-Manashiyah district of Daraa city. Spokesman for the armed forces of the Government of National Accord, Mohamed Qannouno reportedly stated that the government’s forces managed to control Wadi al-Rabea, Kobri 27, Tripoli International Airport, and several other areas in southern Tripoli. Media office of the government’s Burkan al-Ghadab (Volcano of Anger) operation stated that its forces took control of a missile camp in southern Tripoli. The media office also claimed that 34 elements of the Libyan National Army surrendered in southern Tripoli. 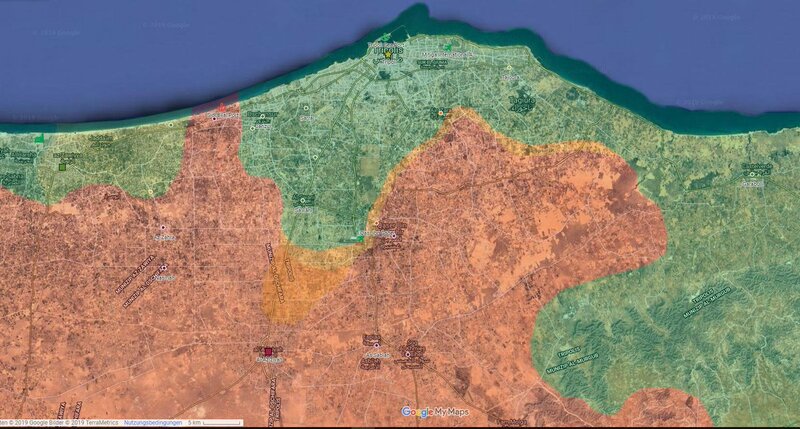 Tripoli Protection Force, affiliated with the Government of National Accord, stated that 17 elements were killed since the Libyan National Army launched an offensive on Tripoli city. Among the killed elements are at least two field commanders; Muetaz al-Sabti (166th Battalion (Misrata)), and Haitham al-Azraq (Katibat Thuwar Trablos). Mitiga International Airport reopened today after it was closed yesterday due to the Libyan Air Force’s raids over it. Unknown gunmen, reportedly belonging to the Islamic State, killed two and kidnapped one civilian in the city of Al-Fuqaha. However, the Libyan National Army reportedly encountered the gunmen on their way towards Al-Haruj, killing all four gunmen and releasing the kidnapped civilian. Islamic Emirate of Afghanistan (Taliban) launched an attack on an Afghan National Security Forces’ military base and surrounding pots in Chushma Dozak area of Sang Atish district. According to the Islamic Emirate of Afghanistan’s Al-Emarah News, 16 elements of the Afghan National Security Forces were killed, 12 were wounded, and 13 captured in the attack. Islamic Emirate of Afghanistan’s snipers killed five elements of the Afghan National Security Forces in Tori Chini and Sri Nawa areas of Chora district. Islamic Emirate of Afghanistan overran an Afghan National Security Forces’ military base between Shorabak and Spin Boldak districts. According to the Islamic Emirate of Afghanistan’s Al-Emarah News, 35 elements of the Afghan National Security Forces were killed and eight were captured in the encounter.